While working behind the bar the other night, a guest visiting Portland for the first time asked me which drink was considered the city's quintessential cocktail. Admittedly, the Pacific Northwest doesn't have the rich cocktail history that other places boast. There is no Ramos Gin Fizz (New Orleans), Manhattan (NYC) or Brandy Old Fashioned (Wisconsin)—i.e., cocktails that have been around seemingly as long as the region itself. There is, however, the Spanish Coffee, the brainchild of local bartender James Kai Louie. He started making it in the early 1970s at Portland's oldest restaurant, Huber's (est. 1879). Today, you'd be hard-pressed to find a bartender here that isn't intimately familiar with its warm glow, rich aroma and labor-intensive preparation. Yet the Spanish Coffee is virtually unheard of outside my corner of the world. And so, when my friends and I try to order it anywhere else, we are met with blank stares. I say, no more! From here on out, let Spanish Coffee dominate bar menus everywhere! Named after the long pour favored by Spanish waiters and bartenders when serving Txakoli wine (and you thought the name was just an ironic Portlandia thing), a true Spanish Coffee is a spectacle. 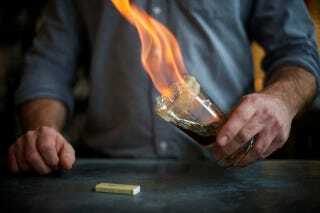 The bartender or server begins with a sugar-rimmed glass containing 151-proof rum, which they then light on fire. (I know, fire is becoming a recurring theme.) Next, in a show of bravado and technical superiority, they pour triple sec and Kahlua into the flaming glass from several feet above, usually with the bottle held over their head or behind their back. It's Old World artistry meets Vegas flair as the flames dance higher and higher in the glass. Normally, I don't have a lot of patience for needless showmanship. This isn't Cocktail after all. Luckily, though, the fire is more than just a simple parlor trick. In one of the more brilliant cocktail techniques I've come across, the heat from the burning rum warms the glass in preparation for the hot coffee that completes the drink while also caramelizing the sugar on the rim. It's an early form of molecular mixology, yet it's simple enough for any bartender to master. Myself, I opt to avoid the death-defying long pour and simply build the drink on a flat surface. For the sake of the hair on your arms, you should do the same. As such, I begin by moistening the rim with a lime wedge, after which I generously apply sugar to the top of the glass and shake gently to discard any excess. I pour in the rum and set it ablaze. Holding the glass at a 45-degree angle, I slowly turn it until the sugar begins to caramelize. At this point, I carefully add the triple sec, Kahlua and coffee. I top my version of the Spanish Coffee with lightly whipped cream and freshly grated nutmeg. Though it might be relegated to the upper left-hand corner of the country, there's no reason not to toast the winter with this warm, spicy Portland classic. And with any luck, you will soon be able to order one at any bar in the country. Moisten the rim of an Irish Coffee glass or small wine glass with a lime wedge. Dip rim in a shallow bowlful of sugar to coat; shake gently to discard any excess. Add rum and light on fire, holding the glass at an angle and turning slowly to caramelize the sugar. Add triple sec, Kahlua and coffee. Finish with cream and dust with freshly grated nutmeg.